It was just about a year ago that I picked up my peeping box of ducklings from the post office. Based on the ship date, I estimate their birthdays to be April 21st. Here’s what I have figured out during my first year of raising ducks. Like chickens, ducks come in different breeds. Some are good for egg laying. Some are good for eating. Some are dual purpose breeds. All ducks except for Muscovy are thought to be descended from wild mallards. These, as a group, are called “common ducks” and can all interbreed. 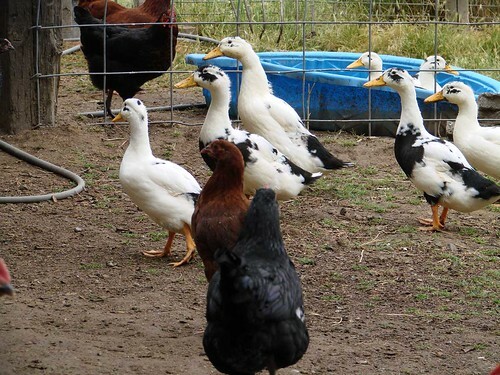 I chose to raise Ancona ducks, a medium sized duck with beautiful markings and good egg laying ability. Anconas are a heritage breed, meaning they are at risk of going extinct because not many people raise them anymore. They tend to stay close to home, don’t fly much, are excellent foragers (hello slug control and lower feed bills), are relatively quiet, and are excellent egg layers. 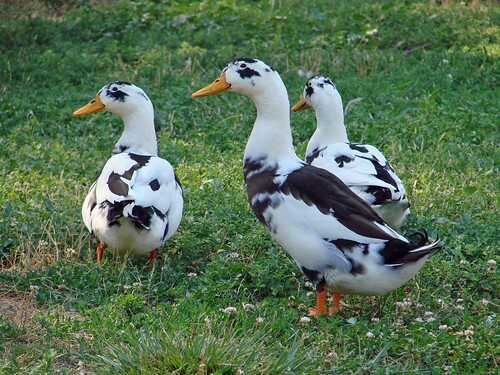 I also like that with anconas, like Pinto horses and Holstein cattle, each duck has different markings. This means you can tell them apart by sight. However, you can not tell the males from the females by feather plumage, except for the curly tail feathers on the male – which take a while to develop. New babies, just hatched April 2nd and 3rd 2013. We have since also inherited one Rouen and one Khaki Campbell, both females. This was partially motivated by the fact that out of an order for 15 ducks (they sent me 16), we had one get killed by a predator before we knew if it was a male or a female, one female with no tail (we called her J-Lo) who ended up with prolapsed girl parts and had to be put down, and eleven, yes, eleven males. Of our eleven males, one died from unknown causes (we suspect he drank out of the sheep mineral salt bucket, that had filled with rain water), two I traded for a turkey, and we kept two for breeding purposes. Which means we butchered 6. We waited a LONG time to butcher. It was part “I’m not sure what age we’re supposed to do this at” and part “When do you want to butcher ducks?” “A few weeks ago would have been good”. And then a few more weeks would pass. More gratuitous cute baby pictures. What finally motivated the butchering was 1) they were eating a lot of feed through the winter and 2) the females – especially when there were only three – were taking a real beating from all the boys. I now know that we should have butchered them at about 18-20 weeks of age. The females started laying eggs at almost exactly 5 months, on September 20th. At 18-20 weeks the males aren’t yet going after the females with gusto, but everyone has their full adult plumage (no pin feathers), which makes plucking easier if you decide you want a plucked bird for dinner. And they are at a good weight, fattened up before breeding begins and with food still plentiful before heading into winter. Live and learn. Last year’s ducks, at 20 days old. Holy fast growth batman! I also learned that I don’t want to pluck ducks. Heck, I don’t even like plucking chickens, and ducks are 10 times harder. It literally took me most of the day to pluck 4 birds by hand, and I still didn’t manage to get every tiny down feather, even after resorting to a trick wild duck hunters use, which is dipping the bird in melted paraffin wax, waiting for it to dry, and then pealing it off (think leg waxing). And the thing about Anconas is they just aren’t all that fatty, or big for that matter. Ours weighed in at between 4 and 5 lbs whole (a bit light – but that was probably because we were just coming out of winter). The whole point of plucking the bird is so you get all of that beautiful duck fat that lies under the skin. 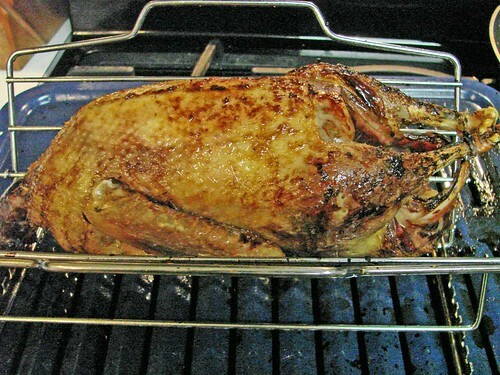 When roasted, that fat slowly melts, bastes the bird, and then can be used for other wonderful things later. But on these birds…not so much. Not a lot of fat. A huge pain to pluck. I wouldn’t go with whole roast duck again. But you got to try it once. In the future, we’ll do what we did with two of the ducks and all of our chickens when we butcher. Skin the breast, legs and thighs. Remove the leg/thigh and fillet off the breasts. Toss the rest. No gutting. No plucking. Much faster, and considering how little other meat there is on the ducks (and I’ve now cooked three of the four of them that I plucked and left whole), this is definitely the way to go for this breed. I’ve made Duck Confit twice. Confit is a method of salt curing a piece of meat, and then poaching it in its own fat. Duck confit is traditionally made with the legs (I use the thighs too). It sounds weird, I know. But its wonderful. This recipe is taken from Michael Ruhlman and Brina Polcyn’s wonderful book “Charcuterie“, which I highly recommend. For each pound of legs (skinned or not), sprinkle on 1/3 oz (8 grams) of salt and what ever herbs you like (I tend to use thyme and black pepper). Cover and let sit in the refrigerator overnight or up to 48 hours. Rinse and pat dry. Place in a pan and cover completely with duck fat (or lard, if, like our ducks, your ducks haven’t given you a lot of fat to spare). Preheat your oven to 180 to 200 degrees (that’s not a typo – you cook them at very low heat) and bake legs/fat, uncovered, for 6 to 10 hours (I usually do this overnight). Refrigerate, leaving legs covered in fat. They can be stored this way for up to a month. When ready to use, scrape off fat and sear in a pan, broil, or grill to crisp up the exterior a bit and warm the meat through. This makes for a killer dinner salad, served with spinach, warm duck, good olives and olive oil, some slivered manchego cheese and orange segments. Divine! Taken May 15th. 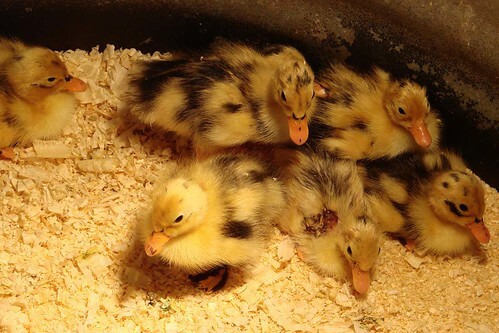 Ducks born on April 21st. So less than 4 weeks old here, and look how big they are! We feed our ducks chicken food. They have a feeder in their pen, but they eat out of the chicken feeders too, and the chickens go in and eat out of the duck feeder during the day. I don’t give them any special high protein ration. It would be too difficult with ducks, turkeys and chickens all running around together to keep food separate. When they were little, we did feed them some “game bird” starter, but that was only because I was also raising turkeys, and turkeys DO require a higher protein ration when they are little. 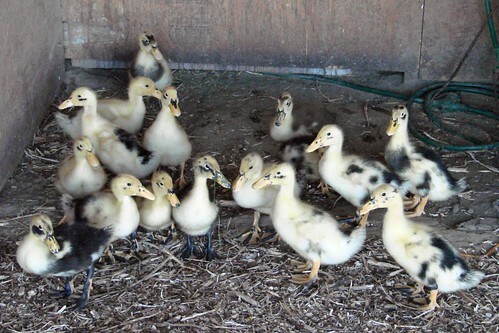 Ducks can be raised on plain old “chick starter” just fine. 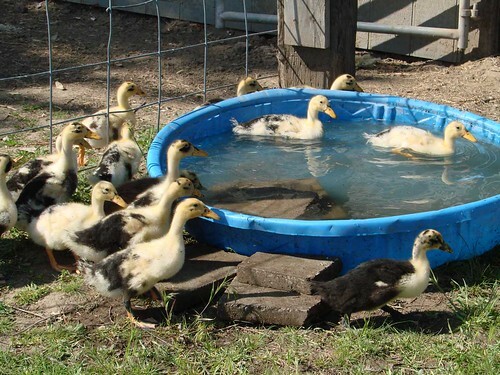 Baby ducks DO need extra niacin (Vitamin B3) for the first two weeks. I dissolve a 100 mg niacin tablet (people niacin – bought where you buy vitamins) in one gallon of water (niacin is water-soluble) and use this as their water for the first two weeks. Niacin is cheap. When it dissolves, there will be some white stuff left over. Don’t worry. That’s just the inert ingredients that were holding the pill together. Six weeks old, and pretty much fully feathered and mostly grown. WAY faster than chickens. Ducks grow fast, and are hardier than chickens. This makes sense when you think about it. In the wild, they would be paddling around in cold water after mom at a very young age. We kept ours in a stock tank brooder for the first few weeks, and them moved them out to the duck pen but kept the heat lamp on so they had someplace to get warm if they needed to. This year, since we already have adults that might trample the little ones, we’ll need to come up with a different solution until they are big enough to hold their own. Ducks are very messy. They love water. They drink a lot of it, and they play in it, as it helps them eat their food. 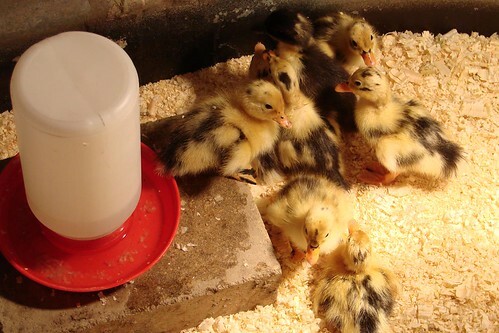 So baby ducks will empty a one gallon waterer into the bottom of a brooder in a day, making for a very messy situation. This year we’re planning on having some sort of catch basin UNDER the waterer, so that it doesn’t just all go into the bedding. Still in the planning stages, but it needs to happen fast. When we lock our ducks up at night, we lock them up WITHOUT water. They are OK for 8-10 hours without it, and it keeps the duck pen to a reasonable level of moisture, so that we only need to clean it out every few months. 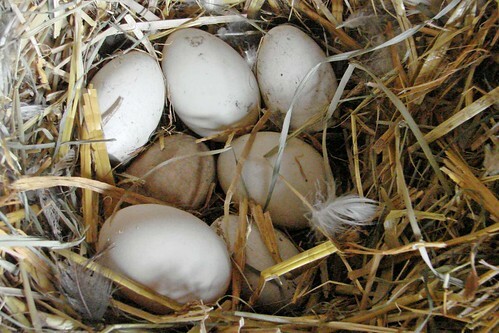 Since ducks lay their eggs at night, it also keeps the eggs, which are laid on the ground in a straw nest, from being terribly dirty. Duck eggs take 28 days to hatch. I can verify this, as I have just incubated 23 duck eggs for 28 days (which seems like forever). Unfortunately, my incubator was having a lot of difficulty holding a consistent temperature, and while they all started to develop, only 8 hatched. [Insert waa waa waa sound here]. But the 8 that hatched are, not surprisingly, very very cute. Lets hope I beat the odds and get more females than males. I am hoping that one of the older females eventually goes “broody” and decides to raise her own batch of ducklings, saving me the trouble of hatching more. But so far, no signs of that. Duck egg nest. There are some small wooden eggs in there too, to keep them laying in the right place. We have consistently been getting about an egg a day per duck since late September. What about the eggs? They are about 30% larger than a chicken egg, and some people describe them as “richer” tasting. They do have a higher fat/cholesterol content per equal volume of chicken egg. Bakers love them in baked goods. They are more prone to getting rubbery if you use too high a heat when cooking. They have more vitamin A and a lot more vitamin B12 than a chicken egg. They can also be stored longer because they have a much thicker shell. Oh, and I can’t eat them. There is something in them that I am allergic to, and every time I ate one, I felt a little worse, sometimes for most of the day. Eventually, I ate two, scrambled, and threw them up a few hours later. That was my last duck egg (though I have occasionally used them in a baked good, and seem to do OK with that, probably because it is a much smaller percentage of egg to everything else). Some people who can’t eat chicken eggs can eat duck eggs just fine. Evidently, I’m the opposite. I do fine with turkey eggs. But that’s another post. My ducks are not terribly friendly. I didn’t handle them a lot when they were small, I don’t feed them a lot of treats, and they mostly try to get away from me when they see me. And I’m OK with that. They aren’t my pets, they are a source of income, and sometimes dinner. But they are beautiful, and great bug eaters, and I have really enjoyed having them around. And they do love a sprinkler on a hot day. Additional notes, January 2014. Having gone through an entire laying year, I now know that egg laying falls off dramatically in August (for ducks that are more than a year old), and then starts to pick up again in mid December (which surprised me – since the days are still so short). It’s nice to have chickens as well, as they lay later into the year, but then resume laying later than ducks. Egg overlap is nice! Miles Away Farm Blog © 2013, where we wish we could eat duck eggs, but are happy to sell them to customers for $5 a carton. Your ducks are so gorgeous and I absolutely love the sounds the ducks make. I am so happy for you that you have a pack of slug eaters also. I would love to have them in my blueberry fields because we have so many of them out there anymore. Yucko!! Keep us posted on the babies! I’ve ordered ancona and ‘assorted meat ducks’ this year from Sandhill Preservation Center. I had a hard time finding anconas. (They will be raised not too far down the road from you at Mesa, WA.) I hope I get a better female ration, though the plan is to only keep about 4-5 females and 1 drake from the bunch, and harvest the rest. Where they largely pastured? I’m also in the conundrum of trying to plan how long before harvest and how I will tell the sexes apart. I live over in the Seattle area (ducks will be at the home farm with my parents), and have been in a confit kick with duck wing confit (from bags of duck wings available at local asian focused grocery stores) and stewing hen leg confit. I have been thinking of trying to find a tub style plucker for the harvest. Sounds like even with mechanical help, it will be a job. Good for you for being able to find Anconas close to home. I tried and tried and had no luck. Yes, mine were primarily pastured, which I define as always having the run of the place, except at night when they are locked up. I do think that by 5 months, the males have their curly tails, so you should be able to tell them apart by then. There is a poultry processor about an hour away from us, and I notice that they only fillet ducks, not pluck them – and I assume they have a plucker. So have wondered if they are indeed difficult to pluck, even with a plucker. My advise. Stock up on some paraffin wax. It really does work. Good luck with your ducks.